The first leg of the mighty and slightly mythic Flambeau River storming out of the Turtle-Flambeau Flowage dam, this trip begins with a bang and ends with a whimper while passing through an unspoiled landscape of Up North forests and occasional rock outcrops. Time: Put in at 1:30p. Out at 3:50p. Wildlife: A bald eagle, mergansers, pileated woodpecker and ruffed grouse. For the sake of clarity, let me quickly tell you what this trip is not. It is not the fabled Flambeau coursing through protected state forest and it’s not the section of once wild country so eloquently described by Aldo Leopold. But this is the very beginning of the Flambeau River, some 40 miles upstream of the state forest. I don’t know why distances are measured out as “legs,” particularly here in Wisconsin with our county and state highways called “trunks” (from which town roads spur off like tree limbs?). To me, the Flambeau here is more like a muscular arm that swings hard out of the gates. The first two miles are essentially rapids, the most challenging of which are Notch Rock and Island Rapids, ranked Class II and I-II, respectively. About half a dozen other rapids lie intermittently for the next eight miles (most are Class I but there is an additional Class II, which is a blast!). In between the rapids the big, wide river is gentle and calm as it takes you past a mostly unspoiled landscape of pretty forests (I saw two houses about midway into this trip, otherwise, there is no development whatsoever – no roads, no bridges, no anything). I nearly gave up on this trip because I was behind the clock, the bike shuttle required a hell of a lot longer trip than I had anticipated and the skies looked like imminent rain. All that, and I still had to drive 5 hours back to Madison after the paddle. I know Barry feels differently about solo shuttling pre-paddle but I myself prefer to bike back to my car after paddling, rather than before. But due to the direction from which I was coming, I dropped my boat off first then drove to the take-out to leave my car and pedal the shuttle before paddling the river (I feel guilty enough already about all the damn driving I have to do to paddle and the carbon footprint it unavoidably creates, so I eliminate as much superfluous driving as I can). I knew that the river trip was 14 miles but the odometer was in the 19-mile range on the road still before I had found the take-out! (It should be noted that in retrospect I missed turning on a road that would have been significantly more direct and would not have caused me so much dread about the bike shuttle – which likely would have allowed me more confidence to paddle the whole 14 miles. C’est la vie.) I pedal in order to paddle, not the other way around. I like bike-shuttling but that is always second and subservient to paddling, which is the reason why I’m out almost anywhere in the first place! Given a rough calculation of time the paddle would take, much less a grueling bike shuttle and then a 5-hr drive home to Madison, I ruled out the 14-mile trip and started to contemplate just giving up on this river and saving it for another time (i.e., less rushed and with a second car). But I knew there was an alternative take-out at the 10-mile mark so I thought I’d just drive there and check it out. The river looked gorgeous and there was another car parked with the tell-all sign of a roof rack. My paddling-self began haggling with my rational self, should I try this or am I just being silly? “We” settled on beginning the bike shuttle and if I hadn’t reached the halfway point within 20 mins, I’d cut my losses, turn back around, ride back to the car, drive back to the boat at the put-in and just drive home. Needless to say, I pedaled hard and fast and flew past the bats out of hell. I made it back to the car in about 40 minutes, whipped off my shirt, dove into the river to cool off, got back out, scrambled the assemblage of the kayak and its accessories together and put-in after all. I’m glad I did it, not only because it was fun and not only because it’s the fabulous Flambeau but also because it saved me from weeks of pestiferous “what if…?” questions. But next time I’ll definitely sink my teeth into the whole 14-mile trip. Also worth noting, not one but two parties of canoeists put-in at my take-out in order to run just the four next miles as a fun, fast afternoon trip (incidentally, you can paddle an additional four miles for an 8-mile trip but those latter four miles are made up mostly of lake-like backwater from the dam in Park Falls). I envy those canoeists living so close to a wildly fun short stretch of river that you can do with your pals on a late summer afternoon! This is a pretty yet rough-and-tumble part of the state. The sense of isolation and simplicity is palpable. The silence is punctuated by the drumming of ruffed grouse in the distance or the sleek breeze through pine lining the shore. I recognize and fully confess that I am romanticizing this part of the state (at least in terms of its landscape, not its political mindset). And I don’t mean to sound either naïve or condescending about invoking “isolation and simplicity.” Vacationing RVs and whining ATVs are never far away and the landscape is not a shangri-la. But when you’re on the water, the human world dissolves before you, quarantined instead on the peripheries out of sight and sound. Short of trekking out to the Boundary Waters or Quetico or just Sylvania, I’ll take my make-believe placebo-like “isolation and simplicity” any day. The rapids on this trip are a lot of fun and perfect for beginners looking for a little more drama than that occasional wink-in-the-eye Class I. Indeed, the first 1.5 miles probably are the most fun (and challenging) on this trip, since the rapids come one after another. Don’t crack open your beer til after you navigate/negotiate Island Rapids! And if you have a spray skirt, you should wear it (unless you’re OK with a lapful of water – which on a hot afternoon I myself didn’t find unwelcome in the least – though I could have done without the beer getting a little watered down). This said, caution does need to be heeded while running these rapids, particularly since the river is wide and deep and the current quite strong. I don’t know if you could touch bottom if you capsized which would make re-entry, boat retrieval and/or rescue a bit trickier than in shallower, narrower rivers. I’m not trying to sound alarmist. The rapids were easy to read and run. I paddled this trip in my 15’-long kayak, not known for hairpin turns! Moreover, lots of folks paddle the Flambeau in a canoe, too. This section of the Flambeau should not be confused with the more whitewater-heavy sections way downstream. These rapids here are ones with minimal risk and maximum fun. This might sound like sacrilege (so if you have rotten produce you need to compost, get it ready to throw at me instead like a chump on a vaudeville stage) but I found myself a little bit bored between the sections of light rapids (I know, I know… Hey! Ouch! Enough with the rotten tomatoes already!). Here’s what I mean about being bored: the surroundings, while always lovely in their own right, become somewhat redundant after awhile. Throw in an occasional hill, a rocky ledge, some braided islands maybe. But because the river is so wide and generally straight (over 100’ wide on this trip) and because there are long miles of (relatively) slow water, the imagination isn’t challenged to wonder what lies ahead around the next bend because there is no bend and you can 200 yards downstream what lies ahead (and it looks exactly like what’s currently surrounding you). Again, it’s positively lovely… but I was hoping for something showier. Perhaps I was thinking of the fabled Flambeau of State Forest renown… This kind of monochromatic “redundancy” is not unique to the Flambeau, to be sure. Any large river feels like this, whether it’s the Chippewa, the Wisconsin, the Black, the Rock, etc. On smaller streams that meander this way and that, one’s curiosity is constantly stoked by the uncertainty of “what’s next.” This is why most landscaping follows an ‘S’ curve or at least something sinuous; I’m no neuroscientist (sorry mom!) but I’m willing to bet that our brains are hardwired to find a wave more interesting than a straight line (isn’t this why “straight” is synonymous with “dull”?). Gardens are wavy. Farms are right-angled. Enough said. The first 1.5 miles are exhilarating and then there’s another zippy, very fun mile at the 7.5-mile mark for a good half-mile; these are where the best rapids are located. In between and after the river is flatwater. Another consideration (not so much something I “disliked” outright) is the shuttle. I concede that most folks don’t paddle alone, so this may be only a relative matter but this section of river does not a fun bike shuttle make. It’s one of those blessing-and-curse matters. The good thing is while you’re paddling there are no roads or bridges but the bad thing is while you’re shuttling the only roads are indirect and so the shuttle is longer than the actual river trip (that too is a byproduct of large straightforward rivers, as opposed to the more meandering streams that double back and forth). I’d paddle to the Agenda landing at the 14-mile mark. This was my intended take-out. The advantage to these additional four miles is paddling back in time, at least with respect to paddling past a ginormous logjam harkening back to the logging era when the Flambeau (and later the Chippewa) were the main “highways” of timber from up north mills to burgeoning cities down south. Plus, there are a couple more islands and Class II rapids to cap off a fantastic trip. Apparently you can’t river-camp on this section… but why is the fee $263.50? 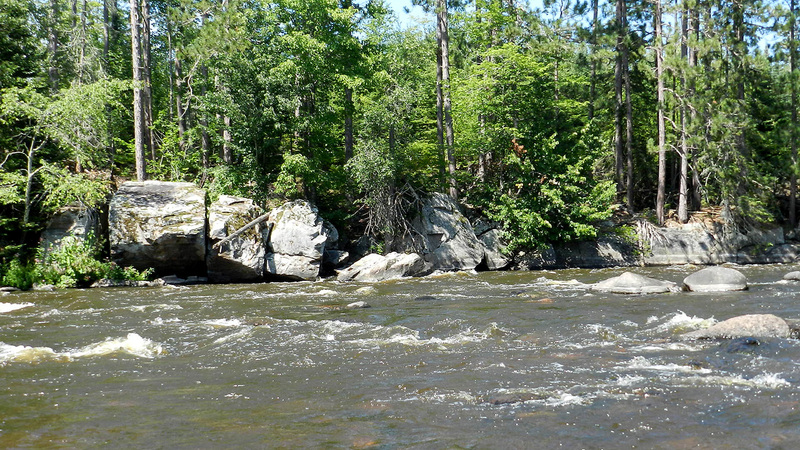 Class II rapids immediately upstream of landing which you can paddle up to, portage around and put-in above to run. Now that’s just an impressive happenstance of balancing! Upstream of a large island (where at the bottom lie aptly named Island Rapids, Class I-II). Bald eagle atop an attractive dead tree. Typical picturesque scene on this stretch of the Flambeau. Atypical scene of slow flow water lillies in a backwater pool. Really? Leaves turning already in mid-August? Quintessential “corridor” of the big, wide, straight Flambeau. Nice rock outcrops here and there. So-called “Bear Skull Rock”. Do you see a bear skull? I don’t. “Rock gauge” but there was plenty of water for this paddle. The largest loon in the world in downtown Mercer.